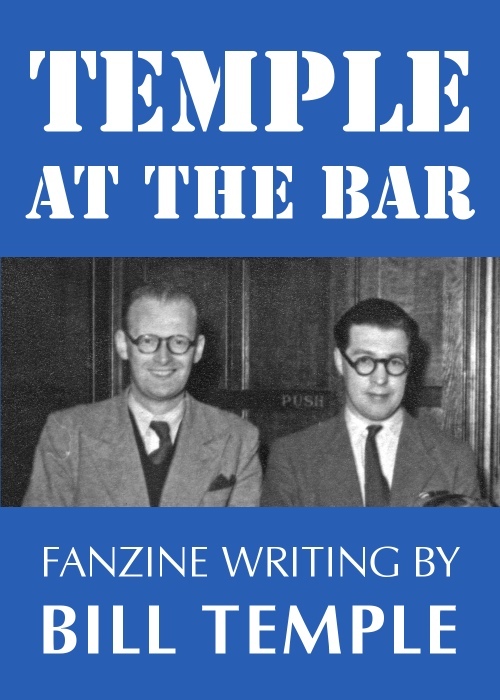 Collected fanzine writing from 1938 to 1960 by William F. (Bill) Temple, SF author, fan and close friend of Arthur C. Clarke. Compiled, edited and introduced by Rob Hansen. First published as an Ansible Editions ebook for the TAFF site on 1 November 2017. Cover photo of Arthur C. Clarke (left) and Bill Temple at the 1951 London convention, from the Vince Clarke collection. 34,500 words. Phew! Well, that’s the necessary background out of the way, which just leaves the question: why choose to collect Bill’s fan writing? Well, quite apart from these pieces being entertaining and informative in their own right, Bill deserves credit for introducing humour and wit into British fanzines where, apart from the occasional wry comment in a D.R. Smith review, they had been entirely absent. Before Bill came along, the writing in our fanzines was largely stolid and po-faced, the advancement of science fiction being a serious business that left little room for levity. Then Bill wrote “The Diary of a Supper”, his report on the 1938 convention (the first piece reprinted in this volume). It was the opening salvo in the battle to get SF fans to loosen up. Presented here in roughly chronological order and written over a twenty-year period, these pieces offer a fascinating look at a time long gone when SF fans and writers in the capital were few enough in number to form a small, tightly-knit community, and of the part Bill played in that community.